Scientists say natural cyclical events appear to have caused the recent influx of stranded Brown Pelicans on the California and Oregon coasts. An investigation by scientists from the California Department of Fish & Game, the U.S. Geological Survey National Wildlife Health Center, Sea World San Diego and International Bird Rescue Research Center did not indicate that manmade actions created the crisis. "Working collaboratively with other organizations, we have been able to quickly examine multiple causes for the stranding event, said DFG Wildlife Veterinarian Melissa Miller in Santa Cruz. "Unfortunately, we are looking primarily at a cyclical event driven largely by weather and oceanographic conditions. Food shortage coupled with bad weather have taken a toll on the pelicans." Mass-stranding of brown pelicans was reported along the California and Oregon coast about this time in 2009, again with widespread food shortages identified as a factor. Some stranded birds have little or no body fat stores and atypical foods in their digestive tracts. Shortages of preferred prey items could be caused in part by the current El Nino event. Some pelicans have also had waterproofing problems with their feathers, possibly related to storm runoff from recent heavy coastal rains. Preliminary findings from postmortem examinations suggest that infectious disease and/or marine toxins are not major contributors to this event. Pelicans at wildlife rehabilitation centers have responded well to care efforts. Anyone who finds a stranded or dead pelican should not approach or handle it but report its location to 800-39-WHALE in Los Angeles County or 866-WILD-911 elsewhere. The announcement on Sunday of a five-year plan to restore the Great Lakes ecosystem bodes well for birds. An Associated Press article cited $2.2 billion as the minimum price tag to clean up decades of damage. Among the goals is a "zero tolerance policy" toward future invasions by foreign species, including the Asian carp, a huge, ravenous fish that has overrun portions of the Mississippi River system and is threatening to enter Lake Michigan. Others include cleanup of the region's most heavily polluted sites, restoring wetlands and other crucial habitat, and improving water quality in shallow areas, where runoff from cities and farms has led to unsightly algae blooms and beach closings. Also promised is a strategy for monitoring the ecosystem's health and holding federal agencies accountable for carrying out the plan. You can find highlights of Great Lakes Restoration Initiative here, and full details appear here. The initiative even has a Twitter profile. Endangered species, such as Red-cockaded Woodpecker, increasingly receive support at more military bases around the country. The Department of Defense spent $300 million to protect at-risk plants and animals between 2004 and 2008 -- "more than it spent in the previous ten years combined," according to a New York Times article today. Take five minutes to watch the video, "Military Bases as Wildlife Havens." You'll get to see a biologist use a mist net to capture a Red-cockaded Woodpecker and hear the bird's vocal protests. 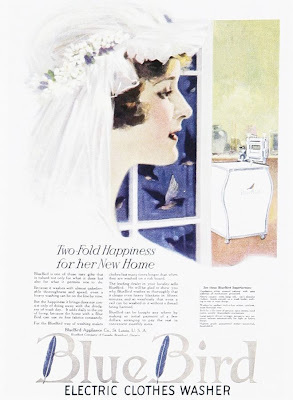 I don't know about you, but an electric clothes washer by Blue Bird Appliance Co. is exactly what I'd choose to gave upon while still wearing my wedding attire. Honestly, it's fun to see how birds fit into commerce, whether as part of a company's name or part of its logo. Note the blue feathers in the Bs above -- as well as the flock of birds on the other side of the window. Grow Wildlife Inc. recently announced that its plans to build Georgia's first specialized wildlife veterinary hospital gained momentum through a partnership with Southern Regional Health System in Atlanta. SRHS will donate expired medical supplies and equipment for the future wildlife hospital. "We are extremely grateful to the staff at Southern Regional for this tremendous contribution to our wildlife hospital project," said Brenda Hudlow, GROW executive director. "While medical equipment and supplies have expiration dates for human healthcare due to healthcare regulations, they are still suitable for wildlife care. I'm thrilled Southern Regional recognizes this important need by its generous donation." The equipment will range from anesthesia and ECG monitors to x-ray and ultrasound machines. Supplies will include syringes, bandages, pharmaceuticals and surgical tools. GROW Wildlife began a campaign to raise $3.5 million to build the first specialized wildlife veterinary hospital in the nation and designed by veterinary professionals. The nonprofit corporation hopes to erect an 11,000-square-foot facility in south Fulton County. "People often ask me why we can't locate the hospital in an existing structure," Hudlow said. "Adapting a building to the specific needs of native wildlife care is as expensive or costs much more. Separate holding areas for raptors, reptiles and both large and small mammals alone dictate a facility especially designed to accommodate them until they are healthy enough to be distributed to a licensed wildlife rehabilitator that will prepare them for release into their natural environment." Are your state parks in danger? Budget cuts across the country could close some or many of your state parks. That could reduce your access to birding sites while affecting the local economy. In response to the budget cuts, NASPD created America's State Parks to highlight the parks' natural and economic benefits. Do you have a favorite state park or two for birding? Have you dealt with a colder, wetter and/or snowier winter than usual? Perhaps you're yearning for spring? Look at this map of birding events during April around the country, and spend some time daydreaming about new birds to observe. "I and The Bird" deadline: Tuesday! If you haven't submitted your blog post for this week's birding carnival, I and the Bird, then you're in luck. The deadline is tomorrow. Please send the hyperlink and a short description to Laura at Somewhere in NJ. This week's edition will appear on her site on Thursday. 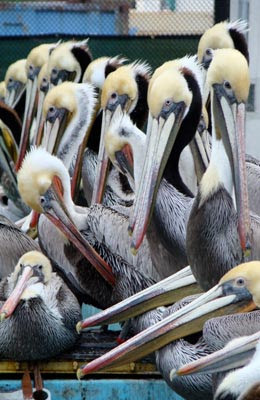 California Department of Fish & Game is investigating the cause behind the hundreds of Brown Pelicans that have come ashore in need of help or dead, according to a press release on Friday. DFG and wildlife experts -- such as wildlife rescue/rehabilitation centers, Sea World and U.S. Fish & Wildlife Service -- have assisted an influx of the confused and ill seabirds since mid-January. insulating properties have been compromised and their feathers have parted, exposing their skin to the cold ocean water and winter weather. Thus, in addition to whatever has made them ill or disoriented, they are also suffering from hypothermia. None of the pelicans received from the Monterey Bay area thus far had significant feather fouling, but some pelicans in southern California did, and the severe winter storms and resultant urban run-off may be a factor. DFG’s Marine Wildlife Veterinary Care and Research Center in Santa Cruz has performed necropsies on 12 pelicans. Most of these were adults in breeding plumage that ranged from thin to good nutritional condition. Three of the dead pelicans had innkeeper worm parts in their intestines, and a few had what appeared to be seal or sea lion bite wounds on the breast, neck or back, with secondary bacterial infections. The necropsies have found that pelicans are eating unusual prey items, which is indicative that they are having trouble finding or accessing their normal prey of anchovies and sardines. International Bird Rescue Research Center is caring for more than 300 big birds but unfortunately is running out of money. Concerned birders can make tax-deductible donations online: www.ibrrc.org. For years, corvids -- usually American Crows -- have held my attention. I've heard the complaints about how noisy they are (Yes, Mom, they are rather loud.) but prefer not to focus on their volume. Instead, I admire their intelligence and dapper appearance. When I learned in 2002 about Betty (above), the New Caledonian Crow at Oxford University, and her ability to make tools -- not just use tools but make them (video) -- I felt thrilled. While driving through the desert to and from Las Vegas, I might get distracted by the huge, shaggy Common Ravens. Luckily, a murder of crows likes to hang out next to the office. While at my desk, I can look through the window and watch their antics. Let's call it an effort to reduce eye strain by not looking at the computer monitor for a couple minutes. 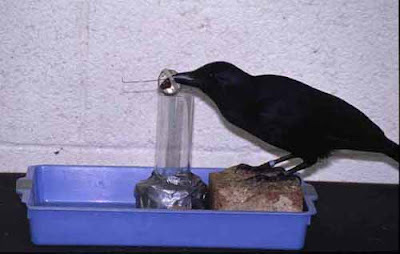 Even though it's early February, I'm thinking about what the crows will be up to in the next couple months -- and Cornell Lab of Ornithology offers a great primer called "Watching your neighborhood crows." 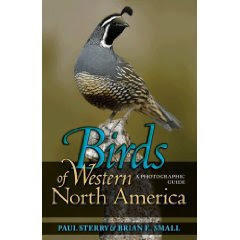 This morning, Linda Rockwell in New Mexico won a copy of the "Birds of Western North America" field guide by Paul Sterry and Brian E. Small. How'd she do this? By writing a haiku that included the word "thrasher." How'd she hear about the contest? By following @WBeditor on Twitter. If you haven't joined the conversation there already, please do. You'll learn of future contests with prizes. The same goes for WildBird's Facebook page. Announcements appear randomly and usually involve a quick turnaround (as in "The first person to provide the correct answer to...") or a deadline (such as "Reply before 9 a.m. PST Friday with..."). Keep an eye on those pages to see your chance to win prizes! Does the current snow and rain in your neck of the woods make you yearn for warmer drier climes potentially full of birds? Look at this map of birding events next month, and start dreaming. Many events occur annually on the same weekend or similar dates. If you can't get out of Dodge this year, consider adding an event to your 2011 travel wish list. Did you know that a literary version of Netflix exists? Booksfree.com offers rental plans for paperback books and audiobooks on CD or MP3; subscribers create a wish list online, receive items via mail and return them at their leisure without late fees or shipping costs. In its selection of nonfiction paperback titles, I don't see a section for nature or another birding-related topic; do you see one? The audiobook selection does include a nature section, but it contains more titles related to pets than wildlife. Fortunately, it does offer various birdsong collections and a few birding-specific audiobooks. 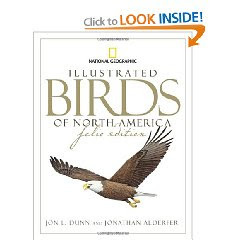 Do you know of any birders who've used Booksfree.com? Would it serve the company to beef up its offerings? Looking for an event that combines birds, birders and birding? Consider making plans to attend an upcoming festival! The map below shows the locations of the events that appear in the "Out & About" department in WildBird. Click on the map to see the various sites. Congratulations to Amy Evenstad of Round Lake Beach, Ill.! 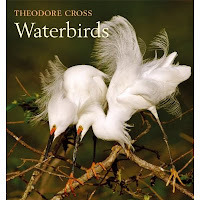 She won this month's First Friday fiction contest and now gets to choose a prize from these three books: "Bird" by Andrew Zuckerman, "National Geographic Illustrated Birds of North America, Folio Edition" and "Waterbirds" by Theodore Cross. 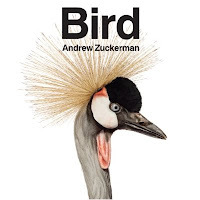 You have the chance to win a recently published birding book if you enter the March contest! Mark March 4 as the deadline for your fictional story about birds, birders or birding. Now, the winning entry in February's First Friday: "Sweets Above and Below." I tell the cashier to keep the change as I pick up my order. Like most of the stuff on the menu at Dina's Inn, the coffee isn't particularly good, but Steve and I both need caffeine to get through the last two hours of our shift. Hotel California is playing in the background as I walk out the door, and I hum the chorus on my way back to the car. Most of the cops in my precinct hate a daylight stakeout. Daytime stakeouts are boring, because the targets are usually sleeping. Me, I love an afternoon out in the car, especially in the spring. The perps aren't usually active, but the birds sure are. On our last stakeout, I got two new warblers and one clean arrest - and Steve doesn't mind if I make all of the caffeine runs, even if it takes me twice as long as it should. A rookie - especially one that likes to look at birds - couldn't ask for a better partner. Our unmarked Fury is parked two streets from the river, on Locust Street. I've tallied a few new year birds on the walk, including a Chestnut-sided Warbler in the park across from Dina's, but as I approach the car, my focus returns to the job. From about 30 yards out, I can see the driver's seat is empty. Aw, nuts. Where's Steve?! I scan the street between the car and the house we've been watching. There's no movement. I see nothing suspicious. The street looks as it did when I left Steve about 15 minutes ago. So where is he? A robin sings from a treetop behind me, but I don't notice it in my growing panic. I put the coffee cups down on the sidewalk and consider my next move. Suddenly I see a dark shadow pass on the sidewalk in front of me. I nearly shout out in surprise when I look up to see a huge dark bird with a light head soaring over the neighborhood. Although I've never seen one in the wild before, I instantly recognize the adult Bald Eagle. I can't believe my eyes. Last I heard there were only about 800 breeding pairs of these birds left in the whole United States. 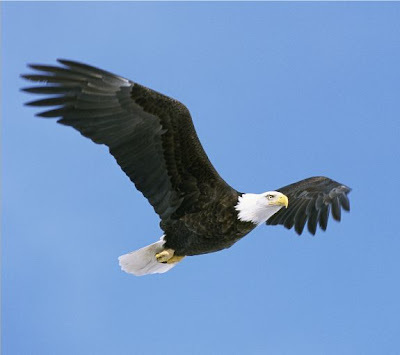 I forget about Steve and the job for just a moment as I watch the eagle gently turn back towards the river. When it's out of sight, I realize I've been holding my breath. Totally exhilarated from the sighting, I look back down to the Fury and see Steve sitting on the driver's side. Puzzled, I pick up our coffees and jog to the car. Steve is cursing under his breath. I see doughnuts, chocolate sprinkles and powdered sugar spilled all over the floor. Steve never left the car; he had just been bent down, trying to clean up the spilled sweets. I sigh with relief and help him with the mess so we can return to watching the house. I tell him about my Bald Eagle moment over cold coffee and brushed-off doughnuts. First Friday contest deadline: today! Do you have a knack for writing short fictional tales? Do you want to win one of the three books below? Then put your fingers on the keyboard, and craft a 500-word piece about birds, birders or birding. Send it to wildbirdATbowtieinc.com by 5 p.m. PST today. * You include your full mailing address. The winner of the February First Friday can choose one of these books. Will you win the chance to receive one of those tomes? Send your story a few seconds before 5:00 PST today! American Bird Conservancy renewed its efforts this week on behalf of Laysan Albatrosses on Midway Atoll National Wildlife Refuge. The rare seabirds unfortunately eat lead-based paint chips from 70 abandoned buildings, and the conservation group -- plus Conservation Council for Hawai'i and Hawai'i Audubon Society -- want Congress to provide funds to remove the paint. In a paper to be released in the scientific journal Animal Conservation, Dr. Myra Finkelstein of the University of California Santa Cruz and co-authors, including scientists and managers from the U.S. Geological Survey and the U.S. 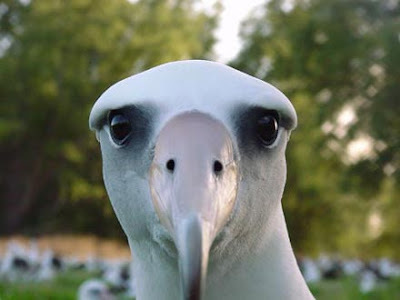 Fish and Wildlife Service, concluded that the death of Laysan Albatross chicks from lead exposure on Midway has long-term consequences for the nesting population of Laysan Albatrosses there. By 2060, there may be as many as 190,000 fewer albatrosses due to lead poisoning. By contrast, removing lead-based paint now could increase the population by up to 360,000 by 2060. The Celebrate Urban Birds project at Cornell Lab of Ornithology seeks applications for mini-grants of $250 to $500. Eligible recipients include museums, afterschool programs, libraries, community centers and local organizations that want to create neighborhood events involving art, gardening, science, community service or other cultural activities. If you are planning an event, you're invited to apply for a grant at www.CelebrateUrbanBirds.org. Organizations working with underserved communities are strongly encouraged to apply. No experience with birds is required. * submit a short final report and share pictures with photo releases. The application deadline is Monday, Feb. 15. Winners will be announced on March 1. Organized by Restore America's Estuaries, the 5th National Conference on Coastal and Estuarine Habitat Restoration will focus on "Preparing for Climate Change: Science, Practice, and Policy" and is scheduled for Nov. 13-17, 2010, at the Galveston Island Convention Center in Galveston, Texas. The Conference Program will address all aspects of coastal and estuarine habitat restoration, in all habitats, at all scales, and all regions. Habitat restoration offers great promise for reversing the trend of habitat loss and degradation, and is a crucial component of comprehensive ecosystem restoration, protection, and management. Until March 2, RAE will accept proposals for 90-minute dedicated sessions (three to four presentations), single 20-minute presentations, and posters. Today marks the beginning of National Bird-Feeding Month, sponsored by National Bird-Feeding Society. This year's theme: "Hatching Out - An Introduction to the Wild Bird Feeding Hobby." The website offers different resources -- such as information about foods, feeders, feeding accessories, and habitats -- and a poster for the event. Can you I.D. the bird in the poster? Who can you introduce to birdfeeding this month?